"You’re about to enter hell,” says our guide as a group of men glance at the entrance to the dark tunnel. 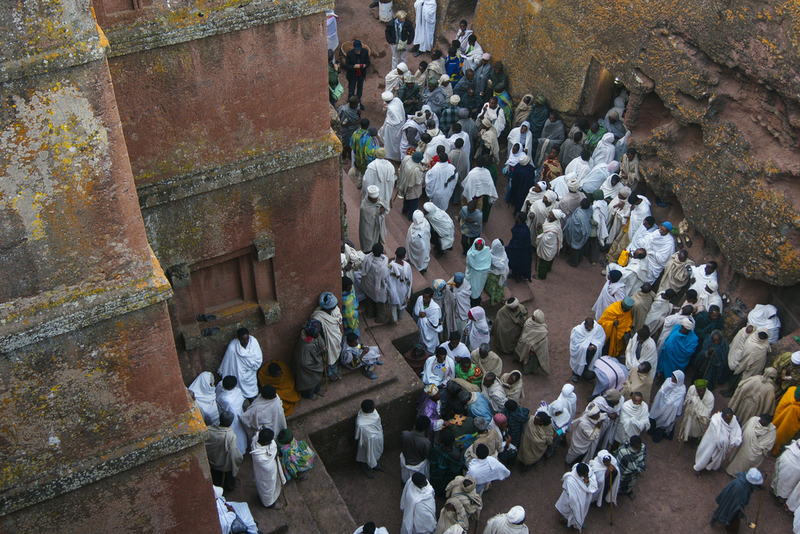 It’s an odd pronouncement considering these are all pilgrims, here to mark Orthodox Christmas in the fabled church-city of Lalibela, Ethiopia. Still, on we go. Encircled by the cool stone, heads kept low as we shuffle along the tunnel, we are repeating a small fraction of the journey pilgrims have made since these churches were built in the 1200s. Ethiopians follow a unique and ancient brand of Orthodox Christianity, related somewhat to the Egyptian Coptic church, which they separated from almost 70 years ago. The faith of the Ethiopians comes from the age of the Bible, not from European colonialism. Orthodox Christmas, celebrated January 7th, draws pilgrims from all over the country. One pilgrim, feet as calloused as his voice, trekked 8 days with his group in order to reach Ethiopia’s second holiest site (only the Chapel of the Ark of the Covenant in Axum trumps it). The pilgrim is barefoot, swaddled in dirty white robes, legs rickety and eyesight failing. Many of these travellers have waited their whole lives to make this spiritual journey. For centuries, Ethiopian Christians would trek across the scalding yellowed ocean of the Sahara to Jerusalem, marking their devotion through pilgrimage. When Muslims conquered Jerusalem, King Lalibela, a 13th century ruler shrouded in myth, called for a second Jerusalem to be built, one that his people could reach without risking their lives. 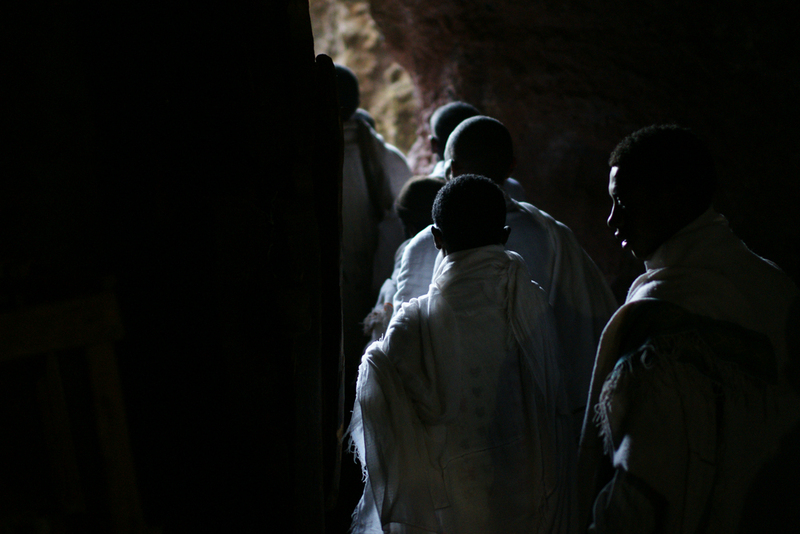 Lalibela set out to build a series of 11 churches hewn from the mountains of the town that now holds his name. Fearing the Muslim invaders from the north, Lalibela had the churches built below the surface of the ground. His idea was that the buildings, when viewed from the lower planes of the hilly terrain, would remain invisible to the armies, thus leaving the area untouched by armed proselytizing. The ploy worked: Ahmad ibn Ibrihim al-Ghazi invaded Ethiopia in the sixteenth century and claimed to destroy a stone church but said nothing about the elaborate complex of the 11 interconnected churches. Connected through a byzantine network of tunnels and passages, the churches allow pilgrims to move undetected by those above. In each room, a priest holds an elaborate cross. He also stands guard over a replica of the Ark of the Covenant, which is housed in each church. Bet Giyorgis—the Church of St. George—is shaped like a horizontal, raised cross. Within, there are fertility pools where those seeking to conceive are lowered by ropes into slimy water that our guide says hasn’t been changed or purified since… ever. One morning we wake up before the sun, and follow the sound of clanging bells. Weaving through the early morning mist, cool bluish grey light blanketing us, we see rows of silent cotton ghosts moving up the hills towards the churches. The clanging message to the pilgrims, beautiful in its repetition, is reminiscent of the Islamic call to prayer. Soon after, we are entombed within the rock, and the chants echo off of the walls. Smaller bells, matched with drum beats, clang inside as the pilgrims mill about the church. Some get the blessing of the priest, others sway in time with the methodical chants. I turn to my girlfriend, who looks as equally out of place as I do. At that moment, time is no longer linear, because the repetitive acts no longer distinguish a moment after another moment. The pilgrimage, for the last 800 years, has been a slow whirlpool of moments, repeating and bumping into themselves.